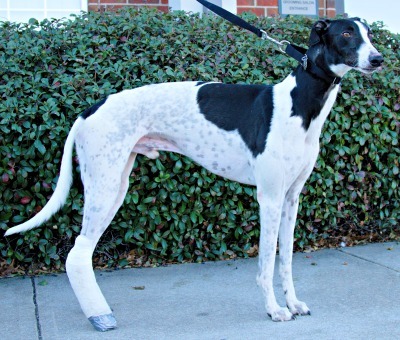 Sam, aka AJN Watch Out, is a 2 year old white and black male greyhound born November 4, 2014. His sire is the Irish bred Tyrur Alex and his dam is KB's Best Crunch. Sam's eight race career ended at Valley Race Park in Harlingen on January 15, 2017 with a right central tarsal bone fracture. Surgery was performed by Dr. Bob Radasch of the Dallas Veterinary Surgical Center on February 1. Due to the type of fracture, an external fixator was applied, which will remain intact for a minimum of 8 weeks. It is not known at this time if Sam is small animal or cat tolerant. Sam's x-rays show that his leg is healed. He has completed his medical procedures and is ready to find his forever home. Sam is a handsome “cow doggy” who loves to give and get affection. He is playful with toys, instigates play among his pack mates and does the occasional zoomie. He loves his meals nearly as much as he'll love you. Sam had a short racing career, suffering a broken leg in January which has since healed nicely. During his rehabilitation, Sam had to be kept quiet in his crate for extended periods; as a result he crates well. The only lingering effect is that he’s a bit tentative getting in and out of the car. Sam has lived with cats in his foster home and is well behaved around small dogs. This all means that Sam is very nearly the perfect dog to steal your heart.